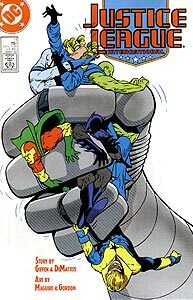 Cover Description: Justice Leaguers Batman, Black Canary, Blue Beetle, Booster Gold, Martian Manhunter, and Mister Miracle are caught in the grasp of an excessively large, metal hand. First cover appearance of Booster Gold since the cancellation of his title series. Brief Synopsis: The JLI assembles to defend Maxwell Lord from the mysterious Construct. Issue Notes: This is the first issue of Justice League to include Booster since Booster turned traitor against the League in the Millennium mini-series. He did not appear in issue 10. For the next several months, Booster will be portrayed as a background member with few lines or active contributions to the team. Presumably, his fellow Leaguers have lingering (and justifiable) trust issues with Booster after the way he handled the events of the Millennium. This is the first appearance of Maxwell Lord since he was shot in the chest during the Millennium mini-series(Justice League International #9). No specific explanation is ever given regarding his miraculous recovery. First appearance of Rocket Red #4 (Dimitri Pushkin) as a member of the Justice League. His first appearance in an issue of the Justice League comic was Justice League #3, where Black Canary hit him in the face, knocking out his tooth. Dimitri is the replacement for Rocket Red #7 who was killed in Justice League International #9. Since the Justice League accepts people, not costumes, as members, Rocket Red #4 is the 30th person to become a member of the Justice League, even though Rocket Red #7's membership is no doubt retroactively rescinded. FIRST APPEARANCE: First appearance of the second JLA shuttle, also on loan from S.T.A.R. Labs. This shuttle is a black ship with red piping on the wings and tails. It looks similar to the torpedo pods used in the Star Trek movies. The previous shuttle was damaged in Justice League International #9. Booster becomes physically ill after being teleported from Happy Harbor to the New York Embassy. He specifically asks for Pepto Bismol, a leading over-the counter drug used for nausea since the turn of the 20th century, before vomiting inside the new shuttle, much to Batman's displeasure. Just as Batman predicted, the JLI shuttle is attacked by a giant robot that appears to be the Construct, a sentient energy being that was born from ambient radio waves in the 20th century. The Construct first appeared to threaten the JLA in Justice League of America, Vol. 1, #142. Captain Atom suggests "Justice League Assemble" as the new league battle cry. This is a reference to their Marvel counterparts, the Avengers, battle cry, "Avengers Assemble." Booster's interaction with the Construct is very limited. Whether this is because of feelings of regret or embarrassment after his recent actions, or simply because of his lingering nausea is unclear. In any event, he is not a factor in the Leagues' fight with the Construct. The Justice League comes face-to-face with Metron, a New God whose realm is science and reason. Metron sits in his Moebius Chair, his personal construct allowing him domain over space and time. In many ways, Metron is the analog of the Marvel Comics Universe's Watcher. Metron first appeared in New Gods, Vol. 1, #7. Boosterrific Review: Again, the writers provide the sort of story that they do best as the international League combats foes both new and old, internal and external. The writers are matched step for step by the art team (including another eye-catching cover). Great book. A fun issue but not a memorable one.